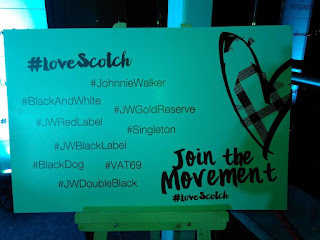 #LoveScotch is about empowering people to express their passion, embolden existing ambassadors and inspire those who are new to whisky, creating a movement across the globe for people to share how they enjoy their dram. 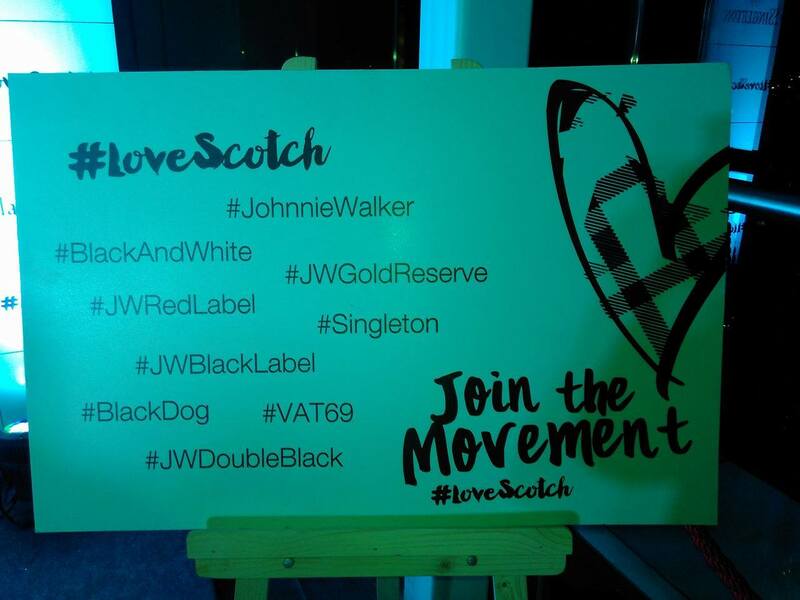 When you party,party like the Bengaluru and keeping up the spirit and the love for Scotch Whiskey, The United Spirits Limited and Diageo continued its #LoveScotch celebration in the Indian Silicon Valley. 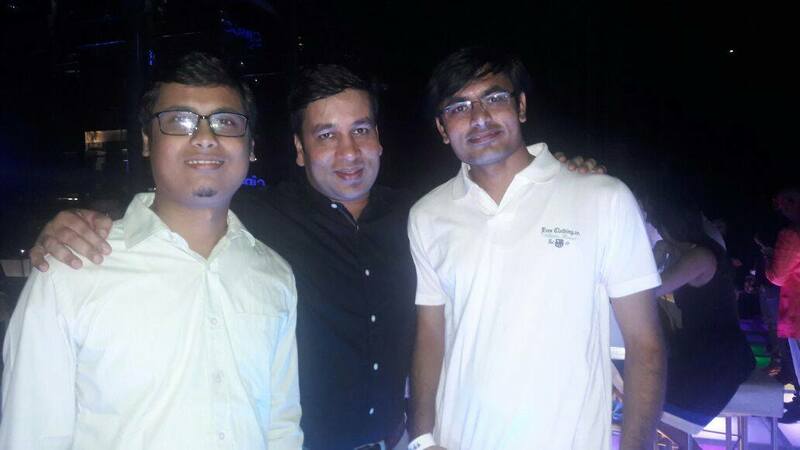 Unlike the last event which was on a Saturday,this was schedule on 27th May i.e. a Friday. For me it was a good escape after a long tireless week of work. I started off directly from the office at 5.30 pm only to reach the venue The Permit Room at around 7.30 pm,curse the Bengaluru Traffic. The Event started at around 7.45 pm with Anushka Manchanda,actor and singer and Nakul Shenoy, celebrated mind reader arriving.The guest’s arrival started an evening of celebration,candid conversation,photo-session and yes a lot of scotch whiskey. 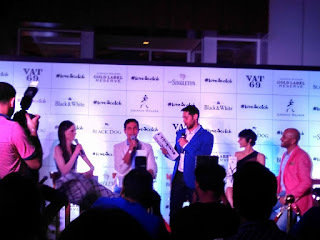 Soon the two celebrities got behind the bar and tried their hand at creating signature serves and exotic cocktails with the help of United Spirits Reserve Brand Ambassador Andrew Qadri. 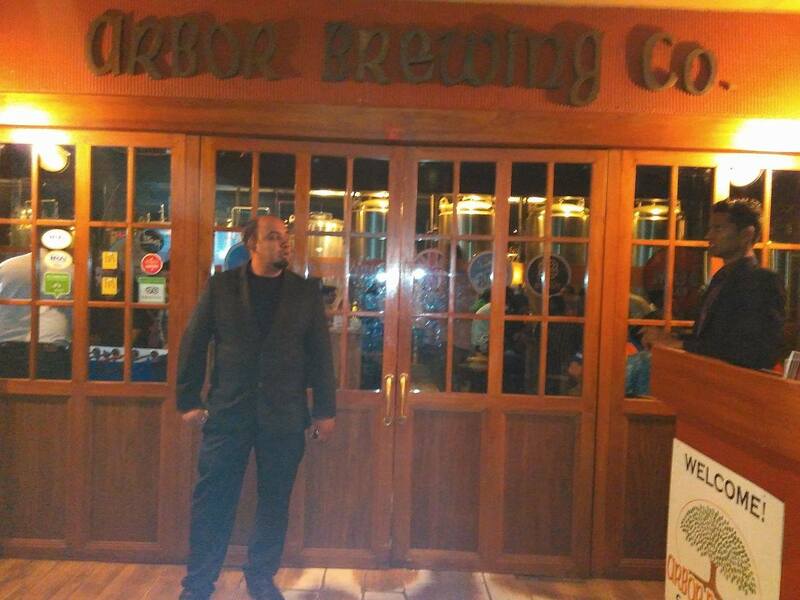 Anushka went with the West Coast Julep made with the iconic Johnnie Walker Black Label while Nakul created Sunset Cinnamon infused with Black Dog Black Reserve.After a splendid session at The Permit Room we headed out to Arbor breweries. 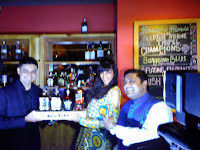 In Arbor, the proceedings start with both Anushka and Nakul sharing with their Scotch experience. 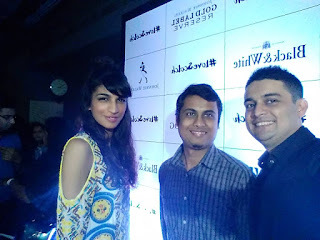 To start off with Anushka, she shared her love for Johnnie Walker Black Label which got passed on to her from her father.She went on saying her love for scotch whiskey is timeless and wherever she travels she always bring back a bottle of her own. 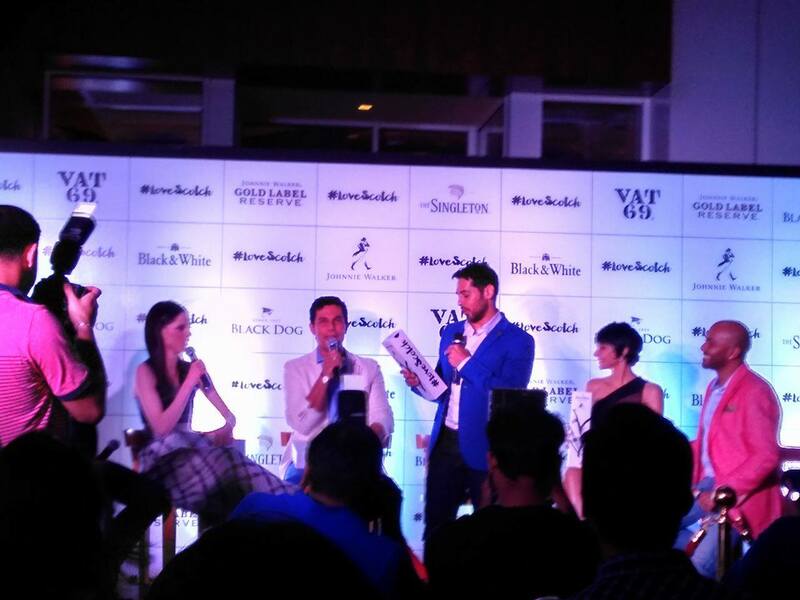 Next up front was Nakul sharing his scotch love and how much he likes a glass of VAT69 of his own. 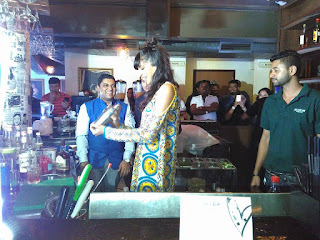 He went forward appreciating the Bartenders and saying it is no easy task to make cocktails as it needs skill and technique to do so. 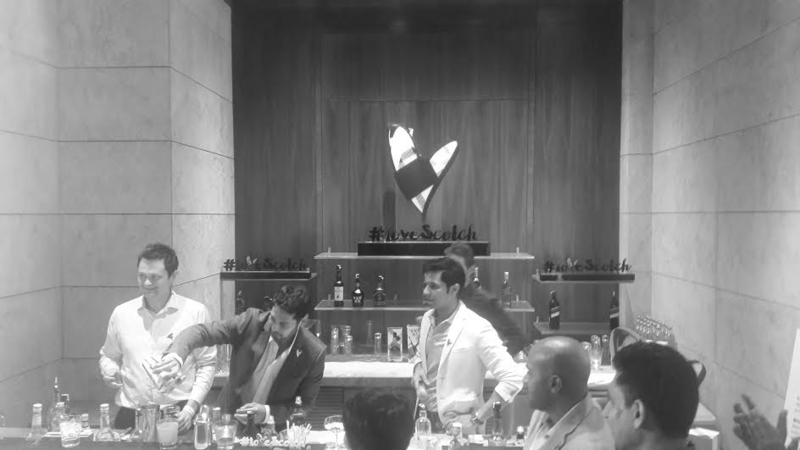 The drink making session was followed by one of Nakul’s mind bending skills and I was fortunate enough to be a part of with. 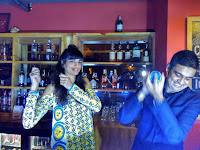 Next up was the something that everyone was waiting around for from the evening, Anushka broke into an impromptu gig that got the guest grooving to her beats. Meantime I too had a some candid conversation with Anushka largerly over her experience of travelling to Assam (my native place) for several shows.She was very down to earth and told that she loved the place and would like to visit it again if something comes knocking. After a quick photo session both Anushka and Nakul left for the day. I was there for sometime more interacting with other fellow bloggers who to came to cover up the event. Whether neat, on the rocks or in a cocktail, there is no right or wrong way to drink Scotch whisky, as long as you enjoy it, that’s all that matters. My way to drink whisky is sitting with some old buddies over some classics playing. Though not everyone enjoys it that way and have their style of own. So,how do you like a glass of scotch? Please, do share…. 21st of May is celeberated as Whiskey Day worldwide and to commemorate this occasion United Spirits Limited-Diageo organised an event .With the people,the enthusiasm there could not have been any other better place than Namma Bengaluru for the event. And Yes my friend, I, too, was invited to cover up the event for my blog. I started for the event at around 4.30pm and reached Shangri-La Hotel at 5.30 pm.The event started around 5.45pm with Canadian Super Model Coco Rocha,the Global Ambassador of the LoveScotch event , first to arrive. 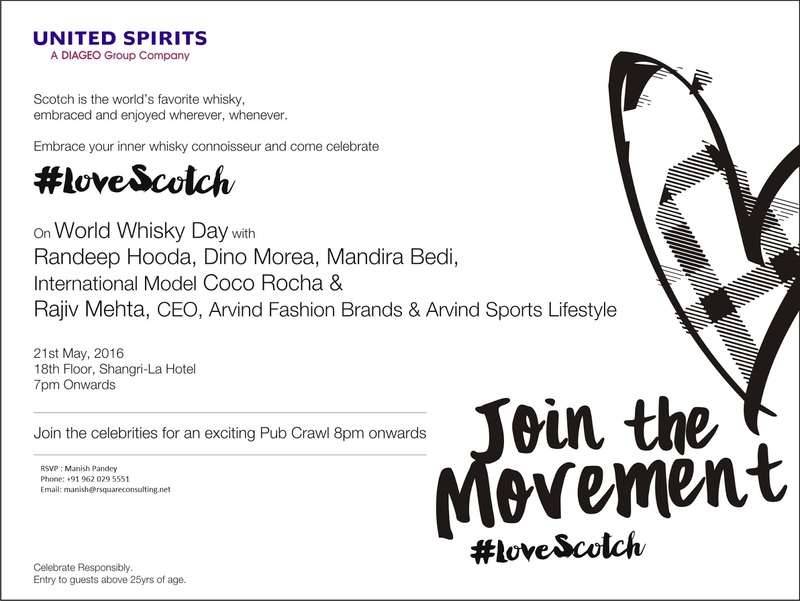 Being the Global Ambassador of the event,Coco came directly from Manila after attending Love scotch event there.Next on the list to arrive was the ever charming Mandira Bedi and she looked the same she did way back in DDLJ, I guess she never aged. 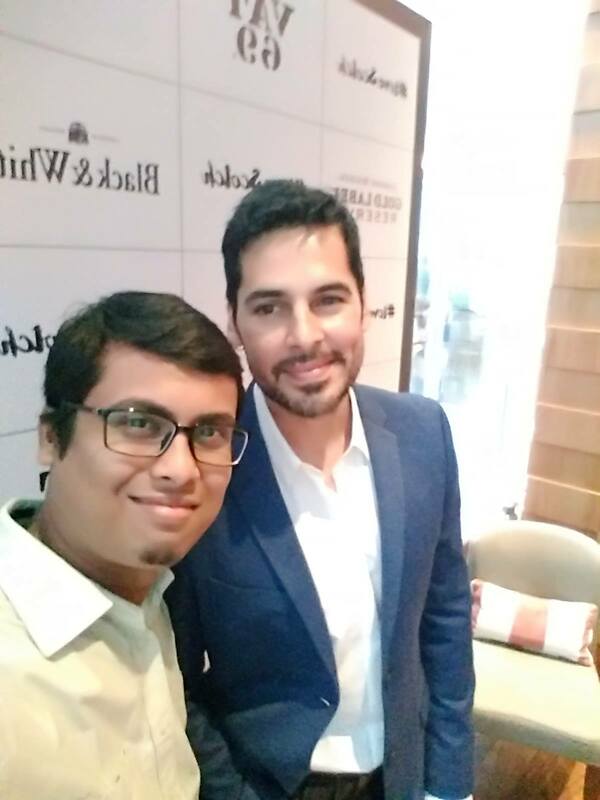 Soon she was followed by the Man of the Moment Randeep Hooda and Dino Morea.There was a photo session with the guests and how can I miss my chances to be clicked them. 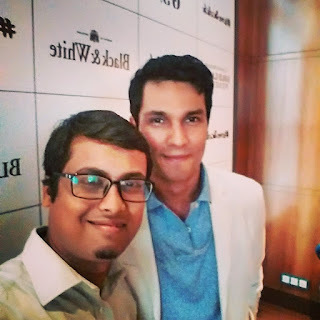 As the event was on and because of World Whiskey Day and what was better than asking the Celebs about their favourite drinks and I started off with the lovely Coco. Me:Hey Coco,You look stunning,You had been the Global Ambassador of the event,firstly Manila then Bengaluru where’s next? Coco:Hi..Thank you very much.Yes Manila was fun and I am hoping for a better time in Bengaluru.Firstly I will be heading back home as I have a small baby to look after and lets see what plans chalk out next. Me:As today is the World Whiskey Day,Whats your favourite of the list? 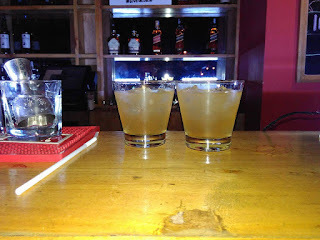 Coco:My personal favourite is Ginger Ale with Johnnie Walker . Me:What’s you connection with scoth and what makes you like it the most? Coco:My Dad’s an Englishman and he had a bar at home,I guess that answers the first part.And what makes me like it is the Smokiness and the texture. Me:Thank you very much Coco,It was nice meeting you. Coco:Thank you very much,same here. Mandira:I would definitely say it's Single Malt Singleton. 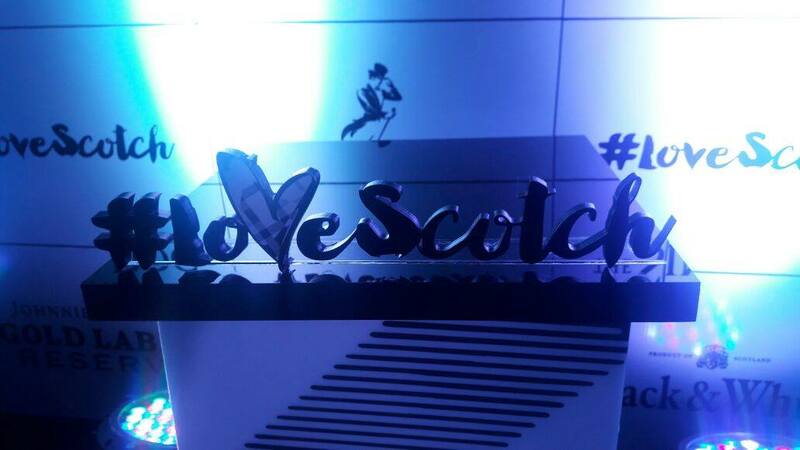 Me:So do you have any story behind your scotch love? Me:Apart from Singleton what else,cocktails? 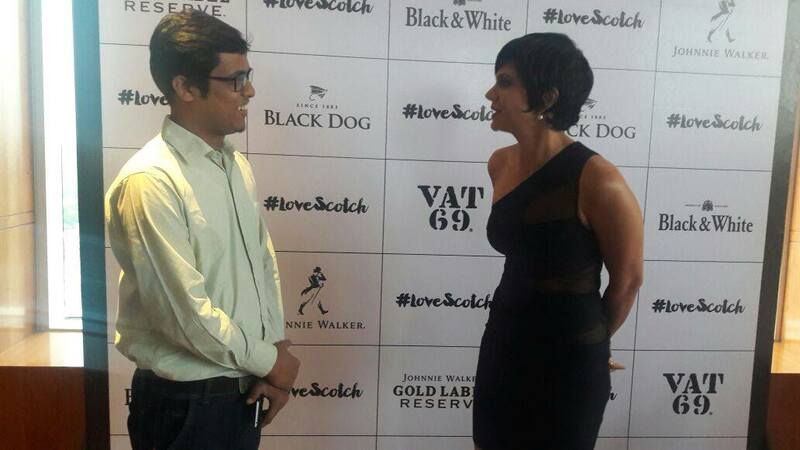 Mandira:No cocktails please.I enjoy Vodka and like Johnnie Walker too.I am looking forward to trying Smokie Cookie tonight. Me:Thank you Mandira,nice talking to you. Randeep:Hey.. how are you man? Me: I am fine,how are you? Me:So Randeep,I have two quick questions for you. Me:I have read it somwhere that you are an active blogger yourself but you posted last back in 2013. 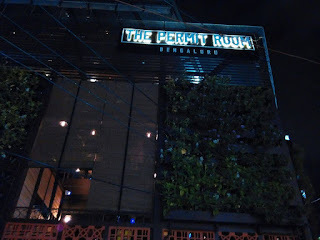 Randeep:Yes,I used to blog and I am getting lots of work now a days(wink;) so I am not getting enough time for it. Me:Being a scotch lover yourself whats’s you favourite? 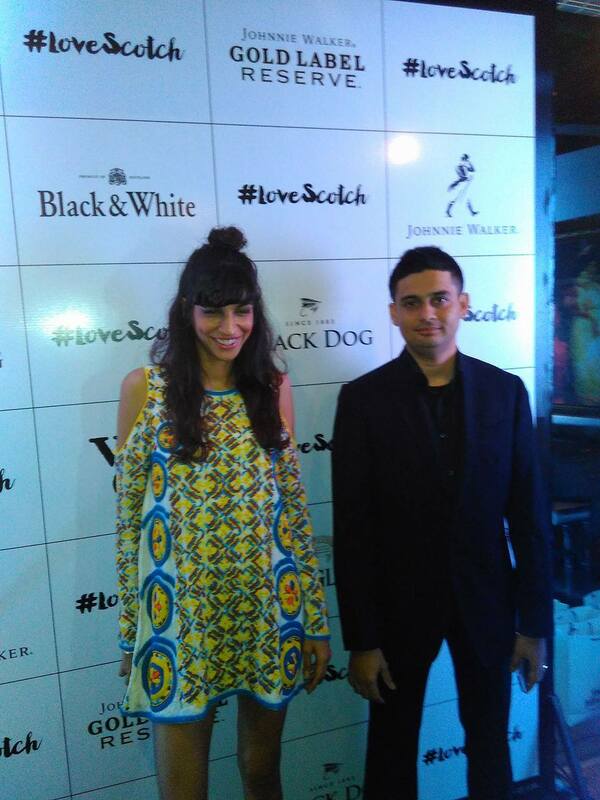 Randeep:Black Dogs on the rocks any day,I also like Johnnie Walker, the aroma it grips you from beneath. Dino:Hey Bro,I am good,How are you doing? 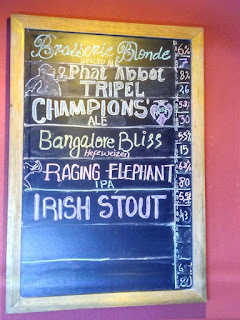 Me: Going great,You are a Bangalorean,what is the best thing you like about Bangalore apart from the weather ofcourse? Dino:What not? I grew up in this place its my home and there is hardly any part of your home you don’t like. Me:So true,So Dino whats your favourite scotch? Dino:Its Black and White mate..BLACK AND WHITE. 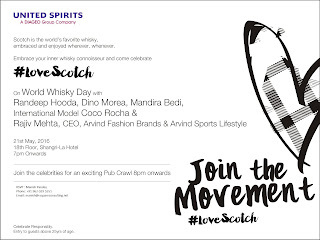 Rajiv Mehta ,CEO, Arvind Fashion Brands & Arvind Sports Lifestyle,another A-lister of the event was late but he did manage to share his love for scotch and the romance with it that started from his B-School. 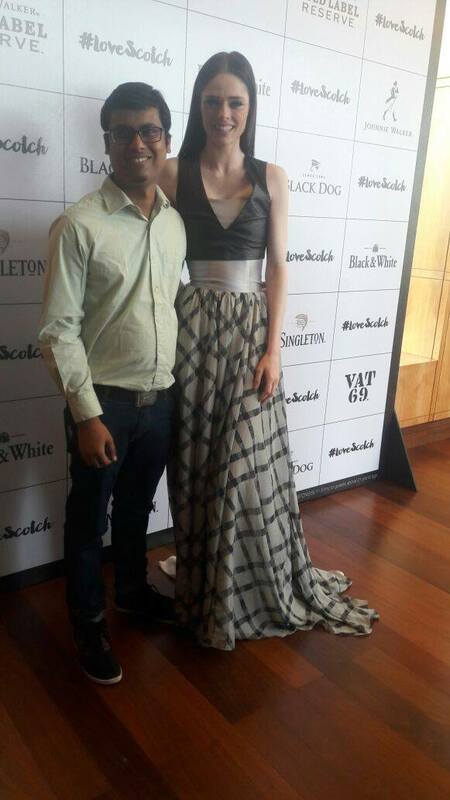 His favourite Scotch is Double Black and he loves to have it with Thums Up. 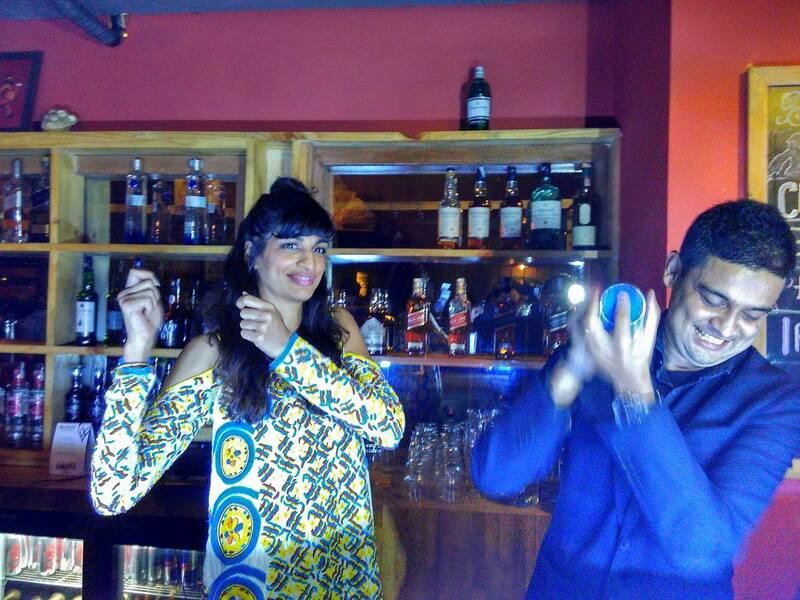 He said, “Thums Up and Scotch ,a briiliant combination. The next stop was Skyye Bar & Lounge,UB City and a luxurious Bus was arranged by the organiser for us from the Hotel to UB City.Skyye bar was as happening as it is always with colourful lights and beautiful ladies all around.We had one more session of Drink making with celebs with Mandira doing the Bartending here which was soon followed by another session in Sancho’s with CoCo as the bartender. I had a wonderful time around with the Celebs,the people around and overall it was one hell of a great event by United Spirits.I hope that they keeping organising many such event and keep inviting me too :D.I would also like to thank Mr.Manish Pandey,R SQUARE Consulting Services Pvt.Ltd, for inviting me to cover up the event for my blog. Another Sunday and just like the rest in the past with the scorching sun outside and nothing to do inside I was just lazing on the bed(my hobby :D) refreshing the same old page again again. And then I don’t know why suddenly something got into my head and I quickly sat up and started searching for upcoming marathon’s in Bangalore(I act like a weirdo sometime :D).There were few lined up for the following Sunday i.e 1st of May and with one being organised by Reebok Running Squad just 800 mtrs away from my place.I was in full swing and registered for the event@6k category at that very moment. It was only in the evening I had a second thought on it and for me waking up on Sunday at 5 in the morning was an uphill task.I knew I needed some partner in crime or else getting caught was most likely,so I asked my friend Akash to join me and after an hour of luring him he finally agreed. The stage was almost set and all we were waiting was for the confirmation mail. 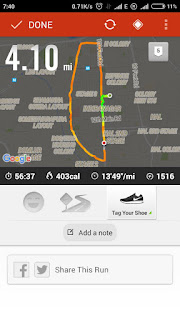 The week passed by and on Friday evening I got a mail and a message on my phone notifyng the timings,the run track and the map.After that I checked with Akash for the mail and at what time he will be coming to my place on Saturday as we need to head out early in the morning on sunday.To my bad he had some important work lined up for Sunday morning and it was not possible for him to make it on Sunday for the run.Satuday evening I went to my cousin’s place for dinner and with akash pulling off I needed someone to give me company so I asked him whether he would like to join and to it he said Yes.Here I was all set for the Run next morning. 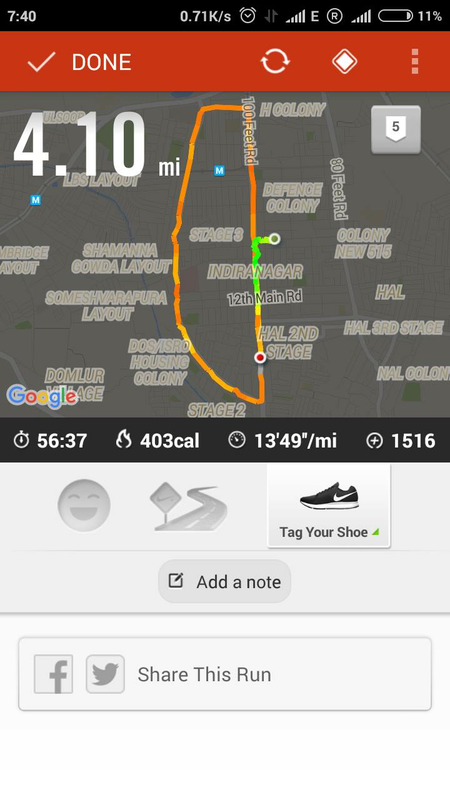 With multiple alarms on I managed to woke up at 5.10 in the morning ,I immediately called up my brother to check whether he is up or not and informed him that I will be there in next 15 mins or so.I got freshened up and with my running shoe on I stepped out. To my surprise my Sister-in-law was also ready to join us when I reach my cousin’s place and together we headed to wards the venue. 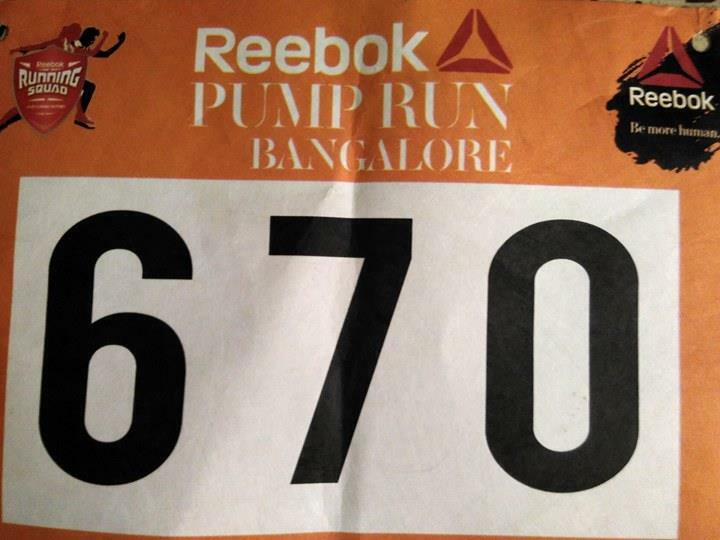 We reached the place at around 5.50 and we collected our respective marathon bib from the registration desk. 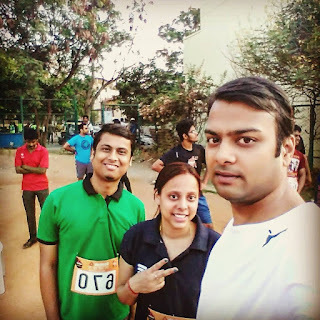 The announcer took us through the rules and gave us some useful information and directions.We started with our before the race warm up and were following the fitness trainer who had occupied the center.After the warm up we were introduce to Kiran kanojia dubbed as the “Lady Blade runner of India” and it was very inspiring as she shared her motivating story with us and her love for run.Finally we had a much long awaited groupie(that’s basic neccisity) before the run. Let it run,the marathon was divided into two legs 10k and 6k,we registered for the 6k and started minutes later of the 10k.It started all well but after 1.5 miles run came the litmus test and I realised what it takes to run a marathon.I contuined with the run with constant backing from fellow runners from all age group and finally completed the target.Post run we had cool down excerise(I don’t know what it is called :P) and were given a pack a Energy drink(ORS :D),Parle-G(truly India’s very own) and banana. We headed back home without some calories and with a smiling face.It was one great experince and will try to have a date with it again in the future. On this Mother’s Day ,let me start with a token of gratitude to all the mothers in the world, that’s the least one can do. For me everyday is a Mother’s day because my very existence is because of her. 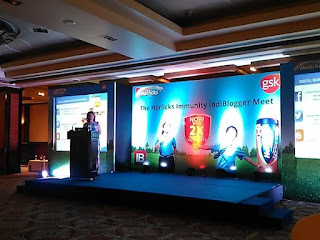 It was only last week when I got a mail from the IndiBlogger team notifying about the upcoming Indiblogger event that was going to happen today i.e. 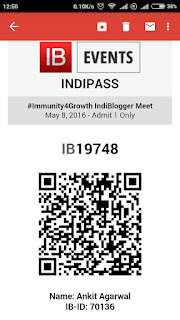 8th May 2016.With the memories of the last outing with the Indi team still fresh on my mind there was no question of not registering for the event this time too.As the day for the event was closing in the excitement was growing stronger and stronger and on thrusday i.e. 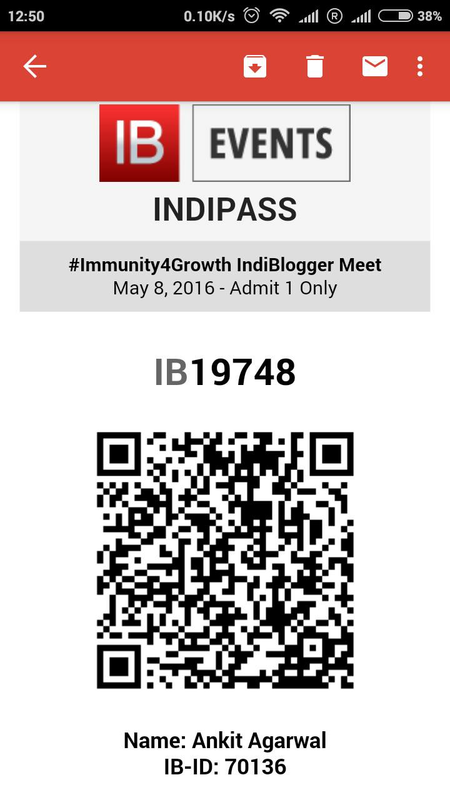 5th may 2016 I got the pass for the event via mail. 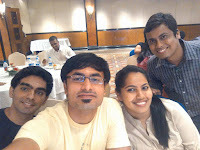 The event was schedule at Taj Vivanta,MG road which was around 20 mins drive from my place from 4pm onwards.I reached the place at exact 4 pm to find some familiar faces waving around,the last event really gave me some good friends :).The event started at 4.30pm(we all know IST stands for Indian stretchable time :P).The host for the day (I woud rather say the host of all the indi events in bangalore) Anoop started the proceedings and with no time wastage he introduced us to the speaker of the day Jill Castle,with a experience of over 25 years in the field of pediatric nutrition,Jill provided us with an in depth details about the impotance of good diet,micro nutrients,lagerly its impact on the health of children and how one needs to be Strong Inside to Grow Outside. 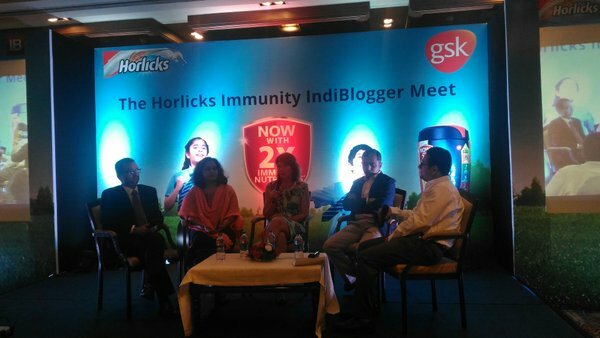 A fruitful and informative talk by Jill was followed with another great talk by Amaan khan, the marketing head of GSK,the parent company of Horlicks which werealso the sponsor of the event .Amaan provided us both with some facts and stats on how malnutritionised the children in India were.He talked about how Horlicks is approaching towards the minimising the problem of Malnutrition among children from their side. He also informed about the #HorlicksNutriMeter tool that discover the hidden gaps in children's dietary and can be easily downloaded by giving a miss call to @8000980009 and how it can help parents in deciding appropiate diet for their child. After the talk we had a good Q & A session with few well-renowned doctors who were also present at the event and were more than happy to discuss and answer all our concerns.After the intercation there was a small fun activity i.e a short quiz based out the event. 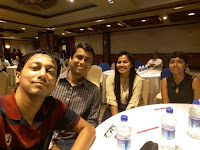 I was in team 6 with Rekha,Rajiv da,Madhu Ba,Rekha,Bhawna.Sidhar and Rayyan and all thanks to Rekha and Bhawna we ended up being the runner up. 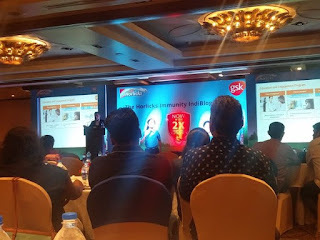 It was time for the food and on no second thought,the food was delicious.After licking the last bite of the dessert from the plate it was time to collect our Horlicks goodies and had back home. 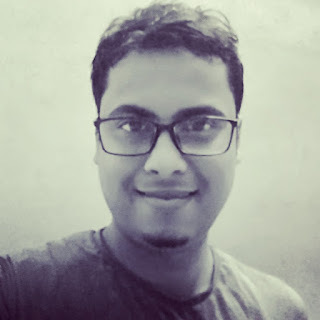 Hi, This is Ankit, a techie by profession and a procrastinator by choice.